I first came across this game in the arcade a few years back. 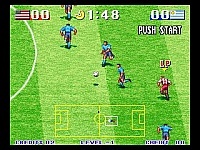 I am not really a big fan of arcade style football games, so I didn't actually bother playing on it. A friend of mine did and he said that it was O.K., but I really wasn't too bothered as I'm more into realistic football games. 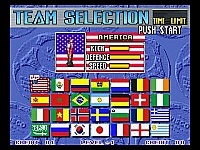 I sometimes used to play the Super Sidekicks games in the arcade now and then, but I got bored of them. 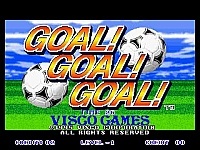 But now that I have played Goal Goal Goal for the Neo Geo I realise that it is actually a nice, simple and fun to play arcade style football/soccer game. The game runs along at a fast pace and is very easy to pick up and play. The controls are very basic; A is used to shoot and B to pass. The power of your shots is determined by how long you hold the button down for. That's about it really. There is a fair selection of International teams to choose from, each with their own different skills and with practice it is possible to score some impressive moves like bicycle kick! This can be good fun, however it can be too easy at times to score which means the game is easy to complete even on a higher difficulty setting. Not many of the real rules of football apply here either, such as the offside rule and you don't even seem to get penalized for fouling people (great stuff, hehe!). The graphics in �Goal Goal Goal� do their job well, but aren't anything special at all. The animation is not all that good and there isn't much detail at all on the players, but you don't really notice that when you are playing. Like I said, they do their job. The sound is your average football game stuff, i.e. the ball being kicked, the crowd cheering, some speech and also some average music. It isn't anything amazing, but like the graphics they are adequate. 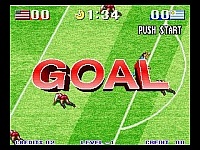 If you are looking for an easy to play football/soccer game for the Neo Geo, then I'd suggest you give this a try. However, I do think that the Super Sidekicks games are superior, so try them as well. Overall, this game is easy to complete, but you will still play it after you have finished it. Two player games can be fun as well, which does add to the replay value. It's not earth shattering and sports games aren't really the Neo's strong point, but you could do far worse than play this.